Heated exchanges between BJP and opposition members ensued his remarks as Sitharaman was heard shouting that Gandhi was "misleading the House"
Congress president Rahul Gandhi on Friday launched a scathing attack on Prime Minister Narendra Modi, accusing him of being a "bhagidar" (collaborator), instead of a 'chowkidar', in alleged graft in the Rafale deal and saying the people were the victims of his "gimmickry". After a no-holds barred and scathing criticism of Modi on several issues including Rafale fighter jet deal, Gandhi walked across the green-carpeted Well of Lok Sabha to Modi and hugged him, a gesture which took the everyone in the House by surprise. In an over an hour-long speech on the no-confidence motion in its support, Gandhi the TDP like many others was "a victim of BJP's political weapon called 'jumla strike' (gimmickry)." The TDP has moved the no-trust motion against the NDA government. Taking on the government on the Rafale deal, Gandhi said "I have no hesitation in saying that... under pressure from the Prime Minister, Nirmala Sitharaman spoke untruth to the people. Who are being helped? Nirmala ji, PM ji, please tell the country." He said the Prime Minister had promised to be a 'chowkidar' but had become a 'bhagidar'. Heated exchanges between BJP and opposition members ensued his remarks as Sitharaman was heard shouting that Gandhi was "misleading the House." Gandhi's speech was marked by noisy protests from the treasury benches as he targeted Modi and projected the RSS, BJP and its top leaders as agents of "anger and hatred" and "thanked" them for making him understand the meaning of a Congressman, an Indian and a Hindu so that he can only have "love" for them. He ended his speech with a touch of drama as he walked across to Modi and hugged him. The prime minister shook hands with him but ignored Gandhi's request to stand so that he could hug him. The Congress leader, however, embraced him as he remained seated. Modi then called him, as he turned back, shooks his hands again and patted him. In his speech, Gandhi claimed he was expressing the sentiments of a section of the ruling party also, as he attacked Modi and BJP president Amit Shah and asserted that the entire opposition and "some of your people (BJP)" will join hands to defeat them in the elections. He said while the BJP only had abused him, heated him and called him 'Pappu', he had no anger and hatred for them but only love. Modi and Shah were "different types of politicians" as they cannot afford to lose power unlike the Congress which is okay to losing it and being in and out of power. The BJP leaders have been acting "out of fear" as "other processes" will start if they lose power and this has generated anger which is "crushing" India, Gandhi said. On the Rafale deal, he claimed that the Defence Minister had turned back on her promise of disclosing the price details of the fighter aircraft under Modi's "pressure", trigerring wide protests from treasury benches with Sitharaman seeking a chance to rebut. As Gandhi declined to yield, Speaker Sumitra Mahajan asked Sitharaman to reply to the charges after his speech. Continuing his tirade, Gandhi said he had asked the French president about the Indian government's claim that it cannot share the price details due to a secrecy pact between India and France. The French leader told him that there was no such pact, he added. He said everybody knew the relationship Modi has with some people and everybody can see the amount of money going into "marketing" the prime minister. "Everybody understands the relationship the prime minister has with certain people. Everybody understands the amount of money that goes into the marketing of the prime minister and everybody knows who have funded that. One of those people was given the Rafale contract.. The gentleman benefitted to the tune of Rs 450 billion," he alleged. 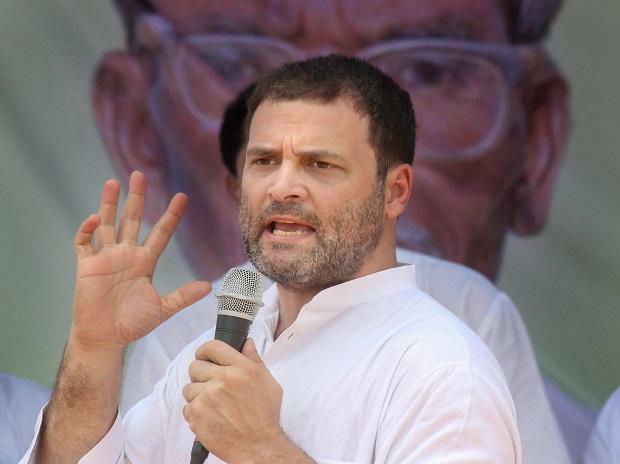 An indutrialist under a debt of Rs 350 billion was given a contract in the Rafale deal and he was benefitted to the tune of Rs 450 billion, the Congress President said, asking Modi to answer if the Cabinet Committee on Security took the decision. The contract was taken away from HAL, a PSU, he said. Targeting Modi, he said, "I can see him smiling. There is a touch of nervousness. He is looking away, not looking into my eyes," intensifying protests from treasury benches with opposition members members rising to their feet to counter them. This is truth, he is not a 'chowkidar' but a 'bhagidaar' (collaborator), he said. Parliamentary Affairs Minister Ananth Kumar accused him of making "defamatory" statement in violation of parliamentary rules. Entire family does not care for the Constitution, he said. Continuing his attack on Modi, the Congress chief said the prime minister "betrayed" Indian soldiers who stood up to the Chinese army in Dokalam by talking to the Chinese president without any agenda. The government waived debts worth Rs 2.5 trillion of 15-20 richest people and industrialists, he said, adding that the Finance Minister refuses to waive loans of farmers because they don't wear suits like the rich. When he accused Modi of benefitting his "friends" by not reducing the oil prices when they went down globally, protests erupted again. Kumar said he must give evidence to back his allegations and the Speaker was forced to adjourn the House briefly with Gandhi telling treasury benches "daro mat, daro mat ... Sach se daro mat (don't be afraid of truth)." As the House resumed, Mahajan asked Gandhi and other members to maintain decorum and restraint in their conduct and said there should be evidence if dirent allegations are levelled. The Congress chief projected the Modi government as one working for 15-20 richest people and industrialist while Dalits, tribals, farmers, minorities, youths and women felt left out. He also raised the alleged financial irregularities involving son of BJP president Amit Shah, whom he described as a friend of Modi, and said the prime minister did not utter a word when the turnover of Shah's son's firm rose dramatically. He dismissed the recent hike in MSP for several crops by the government as another 'jumla strike' like Modi's 2014 Lok Sabha election "promises" of giving employment to two crore youths every year and depositing Rs 1.5 million in people's bank accounts. The MSP hike will result in benefits of Rs 100 billion to farmers across the country while the Karnataka government of the Congress-JD(S) alliance has given them farmers in the state benefits worth Rs 340 billion, he said in reference to its farm loan waiver. Raising the issue of women's safety, Gandhi said for the first time in the history, India is being seen as a country in the world where women are not safe. Women, Dalits and minorities are being attacked across the country and the prime minister does not utter a word, he said. Whenever an Indian is attacked, it is an attack on the Constitution and its architect B R Ambedkar, he said. Ministers are garlanding those accused of such crimes and talking of changing the Constitution, he said. The BJP and RSS have taught him what it means to be in the Congress, what Lord Shiva means and what being a Hindu means, he said. Speaking in support of the no-confidence motion, he said the TDP like many others was "a victim of BJP's political weapon called 'jumla (gimmick) strike'." The TDP had moved the motion against the NDA government. "You are a victim of the 21st century political weapon. The political weapon is the 'Jumla strike'. There are many many more victims like you," he said, adding that the farmers, the youth, the Dalits, tribals and women are also the victims of this weapon of the government. The Congress chief referred to the amount of Rs 1.5 million that was promised to every Indian by the BJP before coming to power after bringing in all black money stashed abroad, and termed it as "Jumla strike number one'. Raising the issue of joblessness which he termed as 'jumla strike 2', Gandhi said against the promise of providing two crore jobs every year, only 400 thousand jobs have been created. He also alleged that unemployment was at its peak in last four years. "This is the truth of your hollowness," he said. The demonetisation decision hurt farmers and the poor, destroying their occupations. The GST was conceived by the Congress and opposed by Modi, then Gujarat chief minister, he said, adding that his party wanted one tax slab but the NDA government opted for several tax rates and sent income tax officials to homes of small traders.